Italian food culture is filled with history and passion. Food brings people together in Italy, as well as here in Fort Collins. Frank and Kim Brewster owners of Midici Neapolitan Pizza, with their GM Chris Jo want to make a difference in other people’s lives, therefore hospitality is at the forefront of Midici. Their mission is to bring friends and family together by providing a trendy upscale environment for people to hang out, laugh together and enjoy high quality, high-value authentic Neapolitan-style pizza and more. This fast-fine dining restaurant, located in the new Harmony Commons is beautiful, traditional and classic. It has a timeless Italian design that appeals to all ages and makes you feel like you are dining out in Naples. The open airy feeling along with the real live Shady Lady Olive Tree and hand-made imported wood-burning ovens that cook your pizza in around 90 seconds, bring a welcoming warmth to all who gather round. Employees bustle behind a curling counter topping pies, building salads, plating fresh burrata, and stretching dough before your eyes. For those not familiar with Burrata, it is the fresh Italian cheese that dreams are made of, heavenly and creamy, and once tried, will leave you with little doubt as to why it is crowned the queen of Italian cheeses. 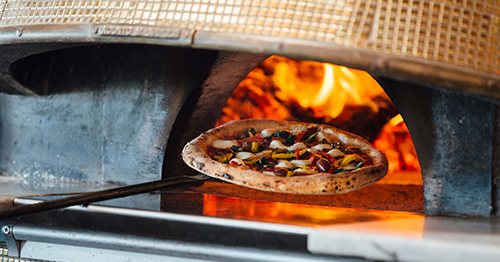 There are about 20 combinations of pizza at Midici with prices ranging from $8.95 to $14.95. The best seller and most raved about is The Margherita. The Margherita is topped with modest amounts of tomato sauce, mozzarella cheese, and fresh basil. The sauce is simply fresh crushed real Italian tomatoes, and the pizza dough staying true to its Neapolitan roots, is made only with 4 fine quality ingredients (OO flour, water, salt, yeast). The tale holds that, in 1889, baker Raffaele Esposito baked three different pizzas for the visit of King Umberto I and Queen Margherita of Savoy. The Queen’s favorite was a pizza evoking the colors of the Italian flag – green (basil leaves), white (mozzarella), and red (tomatoes). According to the tale, this combination was named Pizza Margherita in her honor. Besides great pizza, there are a host of classic appetizers including house-made meatballs with fresh mozzarella, meat and cheese boards, wood-fired yummy truffle cheese breads along with a roster of fresh tossed salads. Also enjoy good hand pressed coffee, tea, beer & wine, as well as dessert options that include Italian gelato and the sinfully delicious Nutella Calzone with fresh berries. Midici utilizes only the freshest, natural high-quality ingredients, many of which are imported from Italy. Most food products are organic and non-GMO. Vegan and gluten-free options are available. Open from 11am-9pm Sunday-Thursday, and 11am-10pm Friday & Saturday.